One of the beautiful things about having a harmonica with you at all times is that lines become much more easier to deal with. Take, for example, when you’re waiting in the drive through line to get a coffee. No harmonica? You’re either bored or listening to the tired old radio. Harmonica? Jam session! 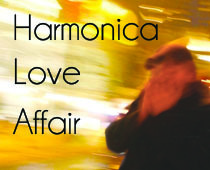 Harmonica is a Seydel Session Steel in A flat. Not my favorite harp, but a solid contender! It’s nice and loud and the tone is pretty solid. Could be a little more airtight, though.